Send SMS in Bulk with the Best SMS Software Application presented here. Send SMS with good speed utilizing your USB Modem with support for Sending SMS. Yes there is no Software Registration required, neither you need to create an Account on any Website to send SMS Messages in Bulk with the Software presented here. The Best part about this Bulk SMS Software is that there are no complicated configurations and this SMS Software detects the connected USB Modem Automatically. The above Screenshot displays few features of the Bulk SMS Software which makes this software really the best SMS Sending Application. In order to Send SMS Messages with this Bulk SMS Software, you can either import Mobile Numbers from a Text File or alternatively, you can add them manually by pressing the Enter Key on your Keyboard. Once the Mobile Numbers have been loaded in the Software, Configure the Text of SMS Message. Note that this is a Free Software and it does appends Name of the Software to the Text Messages Sent out. Maximum Number that can be in an SMS Message is 160 Characters. Once you have Configured the SMS Text to be Sent out, you can select a single Mobile Number and use the Right Click Menu to send out a single Test SMS Message to the selected Mobile Number. Once you are happy with the SMS Message received, you can send the configured SMS Message to all the Mobile Numbers loaded in the Software. The File Menu Allows you to Import Mobile Numbers from a Text File and yes you can also export Mobile Numbers to a text file from the File menu of this Bulk SMS Software. Yes you can even Save the Complete Data File containing the Mobile Numbers, SMS Delivery Report and Date / Time of SMS Update in a data file. When the SMS is sent by the Software, Delivery Report of each SMS Message is updated real time in the software. When sending SMS Messages in Bulk with your own SIM Card, you must make sure that you do fulfill any regulations imposed by TRAI (India), Ofcom (UK), or any other Law making Organisation in your Country. One of the reasons which make this Bulk SMS Software the best in industry is self imposed restriction feature in the Settings of the Software. Note in the above Screenshot that you can Impose a Restriction in the Maximum Number of SMS Messages that can be sent out on a particular day. Another configurable option is the Time Interval at which every SMS Message is sent out when sending SMS Messages in Bulk. Finally, the Device Identifier of the connected USB / Serial Modem as displayed in the Settings Screen can help you to distinguish between various 3G / Serial Modems. 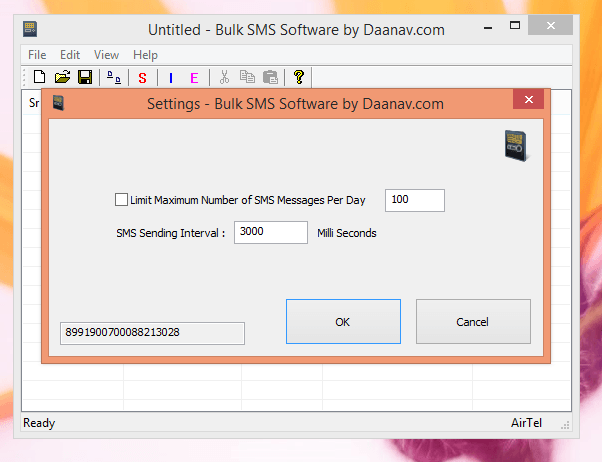 Download this Free Bulk SMS Software and Start Sending SMS Messages from your Windows PC. You can also get the Software’s Promotion Text removed from the SMS Messages sent out by paying in a One Time Software Registration Fee of $150. Yes all upgrades to the application are provided for Free and there is no recurring payment required to be done. This Bulk SMS Software does not requires you to pay any extra fees to SMS Gateway or any other Company apart from your Mobile Usage Charges to your Mobile Operator. Lots of Mobile Operators do provide Bulk SMS Packs for minimal charges, however you must understand the daily SMS Limit as imposed by your Mobile Operator before sending out SMS Messages in Bulk. The above Video Tutorial displays all the features of this Bulk SMS Software. All the features of the Software are configurable and hence, you get full control over the software. Management of Mobile Numbers can be done with the help of a text file or alternatively, you can use the File Saving feature of this software itself. The Video Demonstration displays how to Add Mobile Numbers to the Bulk SMS Software, Send Bulk SMS Messages, correct out any possible issues from within the software, launch Phone and Modem Settings, etc. Sending SMS from your Windows Computer was never so easy and configurable. Download the Best Bulk SMS Software on your Windows 7, Windows 8 or on Windows 8.1 Computer and start your SMS Campaign to Send Promotional or Transaction SMS Messages and reach people by SMS.